The art of welding wrought iron has been practiced by village smiths in their forge fires for centuries. Gas and electric arc welding are however comparatively recent developments. This introductory book explains the process as it has been developed and used in industry, and its applications to model engineering. Welding, by oxy-acetylene or electric arc, is a skill in increasing demand and one for which the basics can be learned without great difficulty. 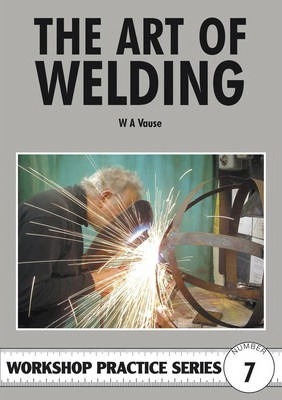 In this book, the author sets out the basic techniques and the art for oxy-acetylene welding, brazing, flame-cutting and electric arc welding with mild steel, cast iron, stainless steel, copper, brass and aluminium etc in sheet plate or cast form. Welding by the Oxy-Acetylene Process. Exercises with Mild Steel. Gas Welding Other Metals. Brazing. Oxy-Flame Cutting. Arc Welding. Exercises in Welded Joints. Cast Iron and Stainless Steel. Pipe Welding. Vertical and Overhead Welding of Mild Steel. Building Up and Reinforcement. Resistance Welding. T.I.G. Welding. M.I.G. Welding. Weld Symbols. Aids to Assembly. Welding Defects.